Leah Barclay’s chapter on River Listening has just been published in ‘Environmental Sound Artists: In Their Own Words’ a new book published by Oxford University Press. Environmental Sound Artists: In Their Own Words is an incisive and imaginative look at the international environmental sound art movement, which emerged in the late 1960s. The term environmental sound art is generally applied to the work of sound artists who incorporate processes in which the artist actively engages with the environment. While the field of environmental sound art is diverse and includes a variety of approaches, the art form diverges from traditional contemporary music by the conscious and strategic integration of environmental impulses and natural processes. art is especially relevant because it addresses political, social, economic, scientific, and aesthetic issues. As a result, it has attracted the participation of artists internationally. Awareness and concern for the environment has connected and unified artists across the globe and has achieved a solidarity and clarity of purpose that is singularly unique and optimistic. The environmental sound art movement is borderless and thriving. 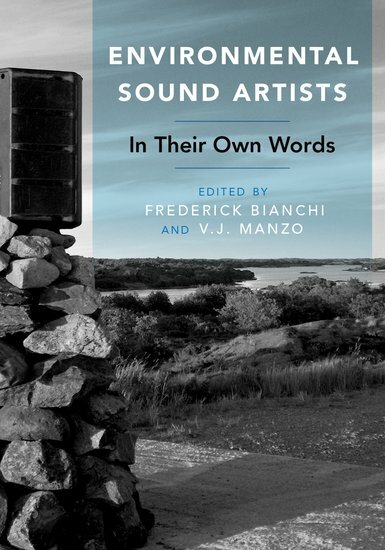 Edited by Frederick Bianchi, Professor of Humanities and Arts, Worcester Polytechnic Institute, and Edited by V. J. Manzo, Assistant Professor of Music Technology and Perception, Worcester Polytechnic Institute. Frederick Bianchi is a composer and music technologist. Recognized internationally for his musical compositions, installations, and innovative music technology development, Bianchi has been associated with interactive music applications since the mid-1980s. V.J. Manzo is Assistant Professor of Music Technology and Cognition at Worcester Polytechnic Institute. He is the author of the books MAX/MSP/Jitter for Music, Foundations of Music Technology, and co-author of Interactive Composition, all published by Oxford University Press. Andrea Polli, Philip Blackburn, Bernie Krause, David Dunn, John Bullitt, John Luther Adams, Cheryl E. Leonard, Jeff Talman, Leah Barclay, Craig Colorusso, Joseph Bertolozzi, Marty Quinn, Bruce Odland, Ximena Alarcón, Zimoun, China Blue, David Rothenberg, Gordon Hempton, Dawn Scarfe, David Monacchi, Christopher DeLaurenti, Aki Pasoulas and Matthew Burtner. Click this link to purchase ‘Environmental Sound Artists: In Their Own Words’ published by Oxford University Press.